Microsoft Dynamics AX 2009 EP provides many new features to empower developers to build and customize rich Web user interface that enables end users to find and access business information quickly and efficiently. Here is a list of high-level Enterprise Portal features introduced in Dynamics AX 2009. You develop the data and business tier components of Enterprise Portal using MorphX, the integrated development environment (IDE) in Dynamics AX. You define navigation and site hierarchy in MorphX. You develop the presentation tier components in Visual Studio and design the Web page using Windows SharePoint Services. AOT serves as the single master of all metadata for Enterprise Portal. It stores all the controls and pages you developed using Visual Studio and Windows SharePoint Services, and other supporting files, definitions, and features, under the Web node. MorphX is used for developing and debugging data and business tier components, defining navigation elements, storing unified metadata and files, importing and deploying controls, storing page and list definitions, and generating proxies. For Enterprise Portal data access purposes, the new programmable object Data Sets is added to the AOT. Data Sets in Enterprise Portal are equivalent to the Form data source for the Desktop form. You can create Data Sets with one or more joined data sources pointing to related tables in Dynamics AX. You can override or add new methods in data sets, data sources, and tables as well as define the data access logic. You generally define the business logic in classes in the AOT. These classes are referenced either in the data set or through C# proxy classes in the presentation components in Enterprise Portal. You can generate proxy classes either from Visual Studio or from MorphX (Tools\Development Tools\Web Development\Proxies). The tables and classes from which proxy files need to be generated are defined in AOT\Web\Web Files\Static Files\Proxies. Web-related components are stored under AOT\Web. The Web User Controls for the presentation tier that you develop in Visual Studio are added to the AOT under AOT\Web\Web Files\Web Controls. These controls are referenced and secured by AOT\Web Content\Managed Nodes. The Visual Studio add-in for Dynamics AX lets you add the controls from Visual Studio to the AOT directly. Static files that Enterprise Portal uses, such as style sheets, configuration files, and aspx files, are kept under AOT\Web Files\Static Files. Images and resources are kept at AOT\Resources. The pages and lists you create in Windows SharePoint Services are exported to the AOT and stored under AOT\Web\Web Files\Page Definitions and AOT\Web\Web Files\List Definitions. Enterprise Portal Web parts site definitions are kept under AOT\Web\Web Files\Web Parts and AOT\Web\Web Files\Site Definitions. The Site Templates node is for any customized Windows SharePoint Services templates. For Web sites, consistent navigation is important for users to perform their tasks quickly and easily. Site navigation in Enterprise Portal consists of a global menu bar that is displayed at the top of the site, the module-level QuickLaunch navigation, which is on the left side, and toolbars that are inside the page. Web modules define the site hierarchy and the top-level navigation. Web menus define the menu hierarchy used by the Dynamics QuickLaunch Web part or the toolbar. Web menu items that point to the page or class are used in Web menus. You develop and debug presentation-tier components in Visual Studio. The Visual Studio add-in for Enterprise Portal provides a project and control template for Web user interface development. You define all the user interface logic in Web User Controls using Enterprise Portal development tools, and you use the Enterprise Portal framework to access data and metadata for ASP.NET controls. The Visual Studio add-in also provides an easy way to add controls to the AOT, import controls or style sheets from the AOT, and generate proxies. It also provides a test page for previewing the user interface and debugging. You use Windows SharePoint Services to develop Web part pages or lists and to edit master pages, which contain the common elements for all the pages. You can use the Create or Edit Page tools of Windows SharePoint Services in the browser and use one or more Enterprise Portal or any Web parts and design your Web page. You can also use the Microsoft Office SharePoint Designer 2007 tool to create or edit Web part pages or master pages. Data Sets is a new AOT node in Dynamics AX 2009. It is used to define the data access logic. A data set is a collection of data usually presented in tabular form. The data set brings the familiar data and programming model known from Dynamics AX forms together with ASP.NET data binding. In addition, the data set offers an extensive X++ programming model for validating and manipulating the data when creating, reading, updating, or deleting in Enterprise Portal. The AxDatasource control in ASP.NET uses data sets to display and manipulate data from any ASP.NET control that supports data binding. A data set can contain one or more data sources that are joined together. The data sources could point to a table or a view in Dynamics AX. Data sources can be joined to display data from multiple tables as a single data source. To do this, you use inner or outer joins. To display parent-child data, you use active joins. To surface data from joined data sources or from parent-child data sets, you use dynamic data set views (DataSetView). With a view-based interface, tables are accessed through dynamic data set views rather than directly. You can access inner-joined or outer-joined tables through only one view, which has the same name as the primary data source’s name. 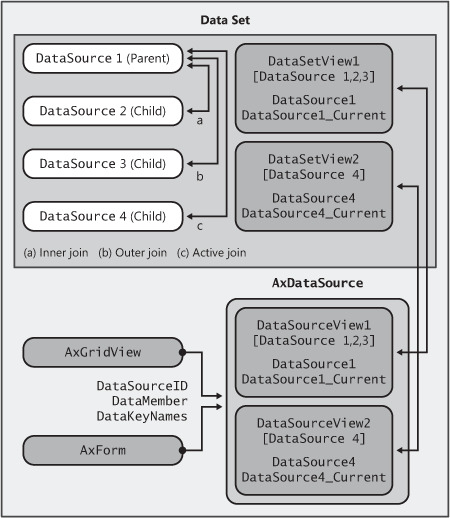 Two views are available with active-joined data sources: one with the same name as the parent data source, and another with the same name as the child data source. The child data source contains records related only to the current active record in the parent data source. Each data set view could contain zero or more records, depending on the data. Each data set view also has a corresponding special view, which contains just the current, single active record. This view has the same name as the original view with _Current appended to the view name. Figure 1 shows the data set views inside a data set and the data binding. Data sets offer an extensive and familiar X++ programming model for validating and manipulating data. Some of the methods you’ll be using frequently include init, run, pack, and unpack. The init method is called when the data set is initialized. It is activated immediately after new and creates the run-time image of the data set. Typical uses of init include adding ranges to restrict the data, checking the arguments and parameters passed, and initializing and modifying variables and queries. The run method is called after the data set is initialized and opened, and immediately after init. Typical uses of run include conditionally making fields visible or hidden, changing the access level on fields, and modifying queries. The pack method is called after the data set is run. You generally use the pack/unpack pattern to save and store the state of an object, which you can later reinstantiate. A typical use of pack is to persist a variable used in the data set between postbacks. The unpack method is called if a data set was previously packed and then accessed. If a data set was previously packed, init and run aren’t called. Instead, only unpack is executed. Data sources within a data set also include a number of methods you can override. These methods are similar to those in the FormDataSource class on the Desktop. You can use them to initialize the default values and validate values and actions. For more information about these events, such as when they are executed and the common usage scenarios, refer to the “Methods on a Form Data Source” topic in the Microsoft Dynamics AX 2009 software development kit (SDK), on MSDN.